It’s really exciting to be able to thank our customers and followers with such a wonderful tropical destination like Key West. We can't wait to show the lucky winners around our backyard, it should be a lot of fun. 3rd Planet, Inc. creators of Get Grounded Footwear,™ is giving one lucky winner and a guest the ultimate Key West vacation experience. This amazing adventure includes free airfare for 2 to Key West International airport, 5 nights lodging at Wicker Guest House on the world-famous Duval Street, a pre-paid dining card , an eco-seaplane tour with Seaplanes of Key West, Fury Watersports sunset sail, gift certificates to Key West favorites like Sloppy Joe’s, Irish Kevin’s, the Lazy Gecko and more. This is the complete Key West island adventure. The first affordable, fully grounded sandal from Get Grounded Footwear™ is not only stylish and comfortable, but effectively enables individuals to connect to the earth and obtain a gentle flow of energy in the form of free electrons. Customers who purchase Get Grounded Footwear’s Groundals® between now and May 15th, 2014 will automatically be entered for a chance to win this amazing Island experience. 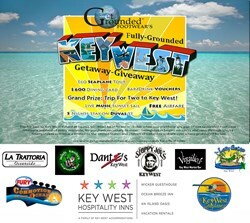 To learn more about Get Grounded Footwear™ and enter the Key West Getaway-Giveaway, please visit http://www.getgroundedfootwear.com. No purchase is necessary for entry, see additional rules and regulations at http://www.getgroundedfootwear.com/sweepstakes.